Knowing the difference between VantageScore and FICO credit score will help you decide which score to purchase in order to determine your credit worthiness. VantageScore was developed jointly by the three credit reporting agencies to compete with FICO score, but it is not as widely used by creditors as FICO score. Every January, May, and September is free credit report time for us and we have been getting one credit report for free every four months from one of the three credit bureaus for many years, well before the law that made everybody eligible for a free report every calendar year. On January 3, I requested our annual reports from TransUnion, but this time I also ordered an extra item, a credit score, a VantageScore credit score to be exact. Though I have purchased FICO credit score several times in the past, I always buy it through myFICO (see how you get a FREE copy of FICO score and Equifax credit report) because FICO score is the standard that is widely used by lenders. Prior to January 3, I didn’t even know there exists a competitor called VantageScore, despite the *new* product has been around for more than a year Anyway, I didn’t cancel my order after being told that I will get VantageScore instead of FICO score. I wanted to see how the new score looks like. And here it is. Since this is the first time that I used VantageScore, I did a little research to get some background information on what exactly it is and how it is different from FICO score. 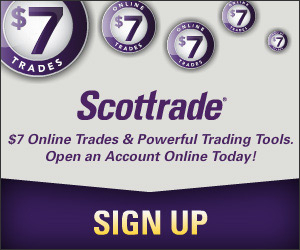 Does not consider “authorized-user” tradelines to assess credit risk. The last feature, regarding authorized users, will actually be implemented in the latest update of FICO score formula. From what I can see, VantageScore’s Utilization plus Balance is equivalent to FICO’s Amount owed and Types of credit uses, Depth of credit is similar to Length of credit history, and Recent credit is new credit. The only item that’s *new* is Available credit, but can’t it be part of Utilization? The sum of your bank credit card account balances is too high: High credit balances may be considered by lenders to be a negative factor when determining creditworthiness. Paying down your balance may improve your score. The amount paid on your open real estate accounts is too low: Having little paid down on some accounts may be considered by lenders to be a negative factor when determining creditworthiness. Your average credit amount on open real estate accounts is too low: Having credit available to you is a sign that you are able to manage your finances responsibly. Lenders usually like to see that consumers have a large amount of credit available to them. The balances on your open accounts are too high in comparison to their credit limits: It is a good idea to use your accounts regularly, but remember to keep your balances low in comparison to your available credit limits. Having a high ratio of balances to credit limits on open accounts may be viewed negatively by lenders. They are quite different from those negative factors on FICO credit score reports, especially the two items related to “real estate account.” Honestly, I don’t really understand what “average credit amount on open real estate accounts” really means. If I am 5 years into a 30-year mortgage, the credit amount could still be low compared to the loan amount, though I have made on-time monthly payment from day one. Does that mean I am less “able to manage your finances responsibly”? I don’t think so! Overall, after comparing VantageScore with FICO score, I feel that I still prefer to get a FICO score to evaluate my own credit worthiness. Even though VantageScore makes a good alternative to FICO score as a competitor, FICO score seems to be more accurate in describing the real credit situation. 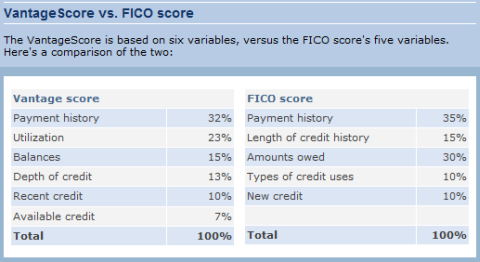 I might be wrong, but when I seen your FICO converted score of 789 from your VS score of 916, something didn’t seem right because I had a VS of 937, yet only a 782 FICO. If you look at a score of 916 in a range of 501 to 990, that puts you at the 85th percentile. Translating that to the FICO range of 300 to 850, that would convert to about 768. When I used that same approach for my VS 937(89th percentile), I got a 789, reasonably close to my equifax FICO score of 782. So all in all, perhaps 20 points isn’t significant. But hey, I’m an engineer, I can’t help it. Besides, you asked what 2+2 equals! It’s always been 4 to me, but unfortunately to some, it equals 96, thanks to the greed of the dot com era(which ended in dot-bomb! ), and the sub-prime meltdown with NINJNA loans (no income, no job, no assests) persuading people thinking they can afford a half-million dollar home and cash out the equity to boot when the value will suredly increase(in a bubble market – NOT!). It was refreshing to see that you’re striving for 20% down on your next home – best of luck. I have done my own which is a 887 Vantage Score which converts to a FICO of 734. However, I know that my FICO is 789, meaning my Vantage Score should be 935!!. This gives me a loss off my FICO score of almost 10%!!!! I have seen tons of posts online. IN NOT ONE CASE has anyone’s Vantage Score been an increase over their FICO score after doing out the math. THIS MEANS EVERYONE GETS SCREWED!!!!!!! I know this system is supposed to rate differently, but it is rating more critical of EVERYONE I have seen posting their scores!! This means higher interest rates for everyone in a already receding economy!! how do the they predict went you lose a young child, or becoming disabled to where you can’t work anymore and it takes 2 years to go through the paperwork to be able to get a check? Sometimes bad things happen to good people. True that bad things sometimes happen to good people, but if someone has bad luck or gets disabled, they won’t likely default if they are strong financially: low debt, 50% equity in their home, $25,000+ in savings/investments. Sure, the disability money is not a lot and you might have to wait months or years to ever get it, but if you have a good financial cushion, you can weather it. On the other hand, someone with no savings or equity, high revolving credit balances, and a few missed/late payments, is someone teetering on the edge of bankruptcy. That kind of person might stay afloat paycheck-to-paycheck as long as he keeps his job and his health, but with no safety net (savings) and all those revolving balances demanding feeding every month, a 6 or 9 month disability could push him into the dire condition where he defaults on his obligations. I’ve been there — not fun. I really have nothing else to add except thanks for the clarification. I had a score of 911 and that seemed strange to me.